Beautiful, soft lips are desired by women everywhere. You see luscious lips featured on magazine covers, in lipstick ads, and on the faces of your favorite celebs (yes, Angelina, we're talking about you). Who says we can't have them, too? 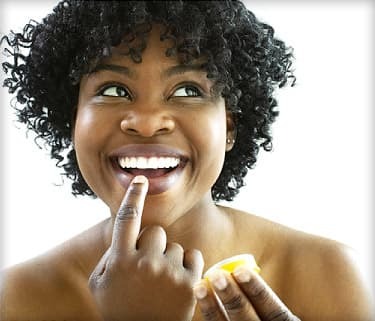 Here are some ways to plump up -- and protect -- our lips. Can't get enough lip balm? If so, check the ingredients you’re putting on your lips. To protect from sun damage, the American Academy of Dermatology recommends choosing a lip balm with an SPF of 30 or higher. "Avoid parabens and fragrance, which can be irritating," says Ranella Hirsch, MD, a Boston dermatologist. Also, if you tend to get chapped lips, you may need to avoid camphor and menthol, super-aromatic ingredients that can dry your lips. Instead, look for ingredients that help lips hold on to moisture. These include glycerin, mineral oil, aloe, lactic acid, and sorbitol. Lanolin and beeswax both soften lips instantly. However, beeswax does not penetrate the surface of the lip. Skip lip balms with artificial flavors and sweeteners; they can cause an allergic reaction. You probably already exfoliate your face and body. But did you know that your lips can benefit from this treatment, too? Apply a dab of sugar and honey (it helps the sugar stick) to your lips and rub gently, using small circular motions. "Turning over those epidermal cells can help stimulate new collagen, which somewhat slows down the aging process of the lips," says Neil Sadick, MD, a dermatologist in New York City. Finish by wiping your mouth with a damp cloth and applying lip balm. The full lip look is in. For long-term lip plumping, you’ll need to visit a dermatologist’s office. "A variety of hyaluronic acid fillers can be injected into lips as an outpatient procedure," says Tina Alster, MD, director of the Washington Institute of Dermatologic Laser Surgery in Washington, D.C. Fillers include Juvederm and Restylane. Dermatologists are also using combination therapy -- fillers plus Botox -- for more natural-looking lip rejuvenation, Hirsch says. There are also lip-plumping glosses for a temporary effect. These are often infused with circulation-boosting essential oils like cinnamon and ginger. Studies have linked smoking with premature skin aging. "Smoking accelerates skin cell damage and collagen loss, which leads to wrinkles," Hirsch says. So skip the cigarettes and layer on the lip moisturizer. Neil Sadick, MD, dermatologist, New York City. Ranella Hirsch, MD, dermatologist, Boston. Tina Alster, MD, director, Washington Institute of Dermatologic Laser Surgery, Washington, D.C.
Rollison, DE, Cancer Causes Control, February 2012.